How to deploy tables in Notes app? Here’s how you can now insert tables in Notes app in iOS 11 and rearrange/delete/add the columns, rows etc like an excel sheet. Apple brings lots of other features and improvements in iOS 11 Notes app like scanning documents, lock function and more. Try these steps on how you can use & add the multiple tables in iOS 11 Notes app along with adding row or columns, delete or rearrange on iPhone or iPad. Inserting tables and adding multiple columns, rows in iOS 11 Notes app is very simple and useful to record or track your data. Step 1: Launch the Notes app on your iPhone or iPad. Step 2: Now, either you create a new one or open an existing note to edit. Step 3: Simply, tap inside the Note app & bring up the keyboard. Step 4: After then you will able to see the Table icon(Boxes) as in the screenshot. Step 5: Just tap the table icon and the table will now be added to the Note. Whenever you do have a many data to be store in Notes app, you need to add more columns or rows. So, in that case, simply tap on the (…) gray bar next to an active row or column. 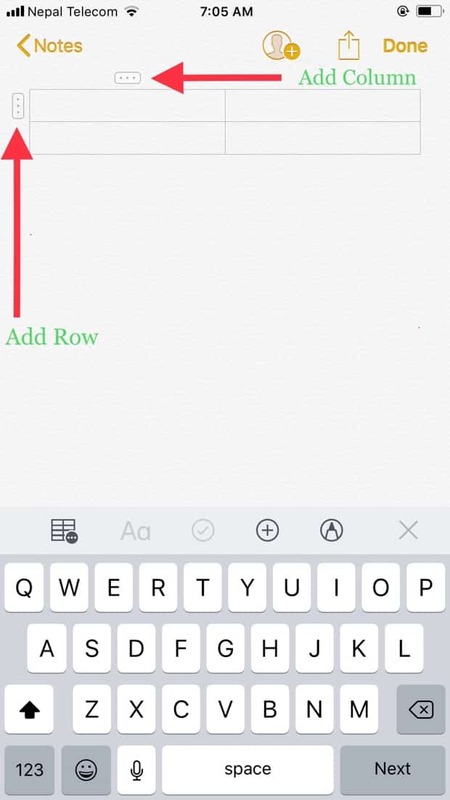 After then tap on Add Row/Column. For deletion of iOS 11 Note’s columns or rows, just tap on the (…) gray bar next to an active row or column. Next tap on Delete Column/Row. For arranging the columns and rows, long tap the tiny (…) gray bar or box to highlight a row or column and then drag it into up and down to the position. Like earlier, simply tap the Table icon(Boxes) in the left side of the Note app if multiple tables is needed. Lastly, you can easily copy, share, delete or convert the table of Note created on your iPhone or iPad. For this simply tab the table icon and will shows up the options like Copy Table, Share Table, Convert to Text and Delete Table. Choose any of the option you need to do.